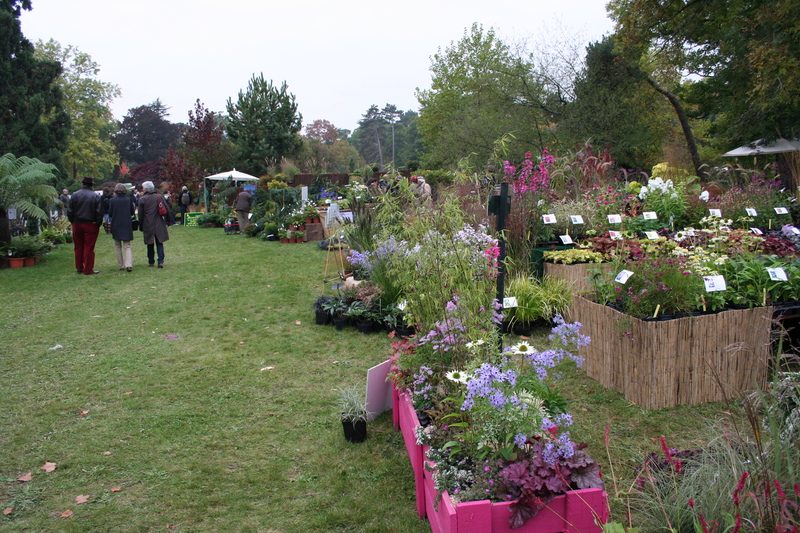 The day of our annual pilgrimage to the Courson Festival of Plants last week coincided with a general strike. The good people of France are unhappy with a proposed retirement age of 62 and the political opposition demands that the law is halted in its progress through parliament. Just in case the government didn’t hear, the Socialists called this strike and several others both before and since, failing to highlight the fact that their own plans only offer six months less. Fuel is in short supply but throwing caution to the wind we drove the 200-odd km up to Courson anyway, trusting that we would be able to fill up somewhere on the way back. With the autumn planting season just around the corner we simply could not miss this opportunity to stock up with plants. The show was as usual wonderful and as usual we restricted our spending by bringing a limited amount of cash and refusing to consider credit cards for additional purchases. We still assembled an impressive selection of specimens for the new beds I am creating around our newly installed log cabin. 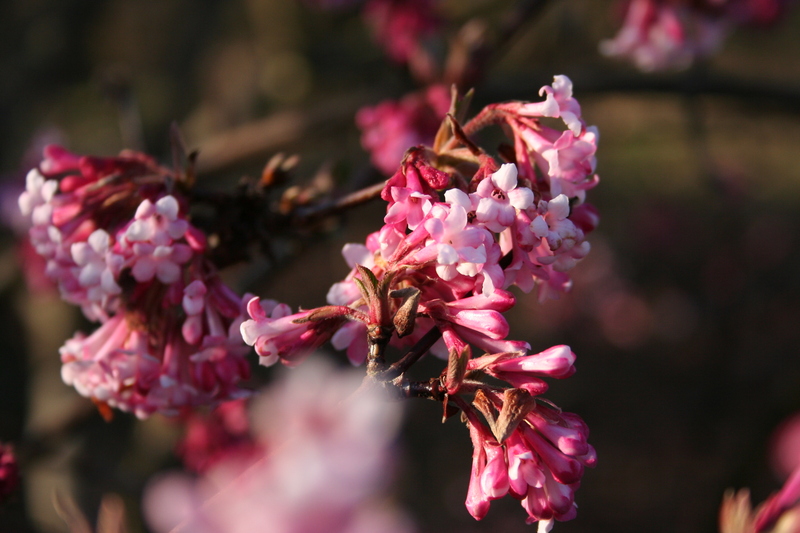 Some of these plants are well known to us and are “must haves” on our mental check-list. Others, for one reason or another, I have never grown before and this is always exciting. Early purchases included Echinacea Meringue, with a delightful cream and white flower, selected to add more colour to our White Border, Echinacea Tomato Soup, an amazing red form on a tall plant and Hosta Great Expectations, all from Hostafolie, a nursery exhibiting from Belgium. The Hosta is a sport of H. Sieboldiana elegans with wide, irregular, blue-green margins surrounding an ever-changing centre; it starts out chartreuse in the spring, turns to yellow, then to creamy yellow, and finally to white. Random fern-green streaks are painted between the margin and centre of each leaf making each one unique. It carries masses of white flowers in the summer but some gardeners find it temperamental: I’ll have to tall to it about that! We are keen to have Hostas near the cabin and this is our second variety. 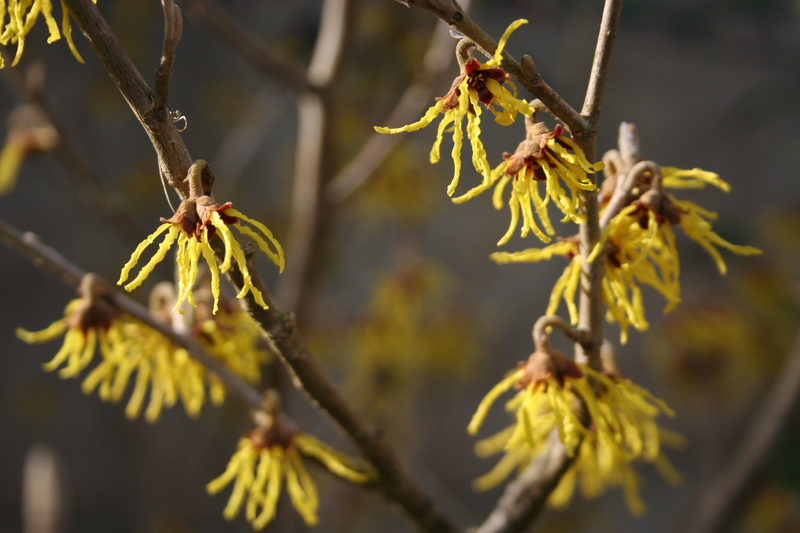 Dryness is not something they appreciate but they are ideal in moist shade. Slugs and snails are a worry as they can badly damage the otherwise attractive foliage, but we have had few problems so far with our existing plants. 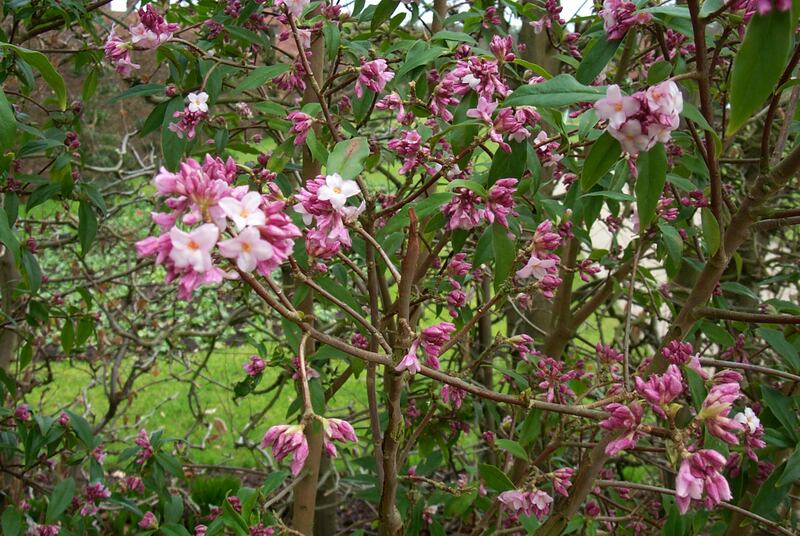 In our Hertfordshire garden one of our great pleasures was the scented Daphne odora Aureomarginata, an evergreen shrub from China. 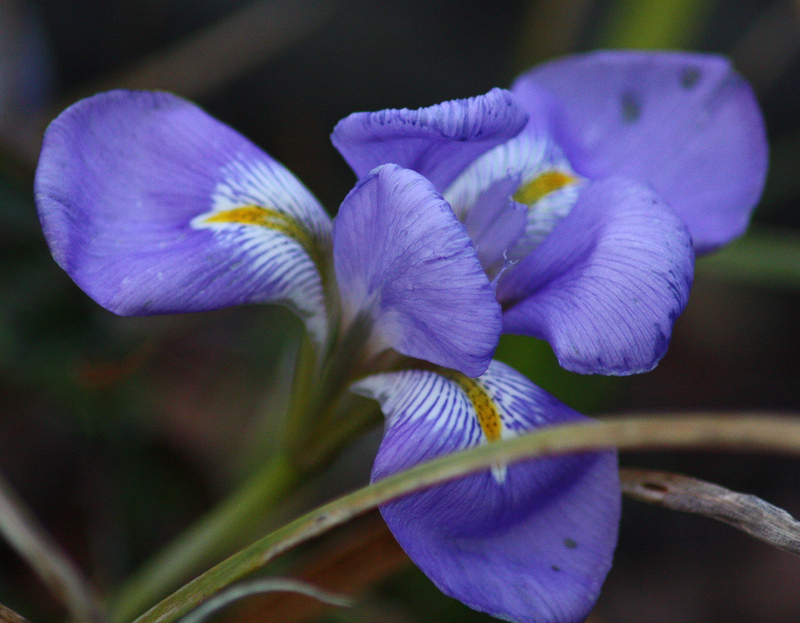 We grew it in a protected spot next to the conservatory door, so the perfume could waft in on the cool February air. We bought this and a couple of newish shrubs from another nurseryman: Magnolia Black Tulip, a Jury hybrid from New Zealand and Mahonia nitens Cabaret, which I raved about but failed to buy last year. 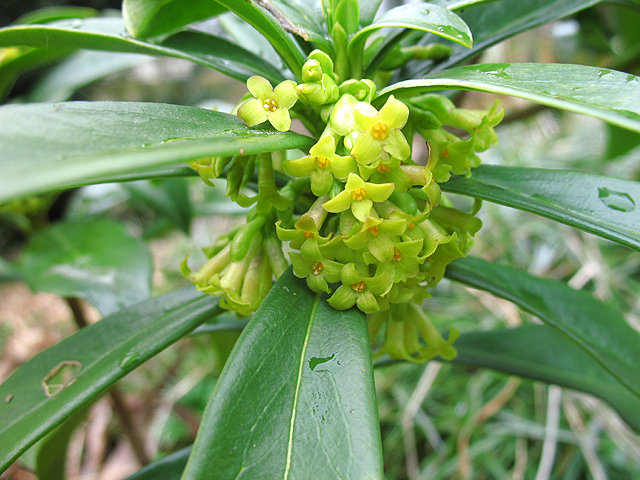 From yet another stand we selected a second Daphne, this time D. tangutica, also Chinese, flowering on and off for much of the year, evergreen and deliciously scented. Often thought of as a choice and difficult plant, the RHS have awarded it an Award of Garden Merit, which suggests quite the opposite. 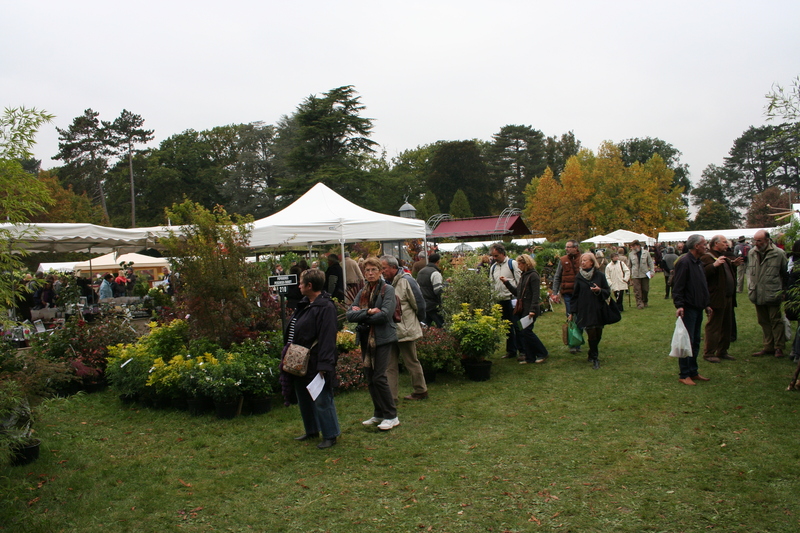 There were several UK nurserymen at the show and Trecanna’s bulb stand was buzzing with customers. Keen to support a Cornish boy far from home, we bought a few Arum Lilies and a Colchicum from him. The Arums are the hardy white sort – Zantedescia aethopica. Being a moisture lover we will plant it next to the Hostas but I have noticed that while the biggest plants grow in shady spots, if you want more flowers it needs more sun. A little care will be needed when we plant them next week. A traditional French song tells of Colchicums in the meadows signalling the end of summer and wild forms are a common site here in the early autumn. 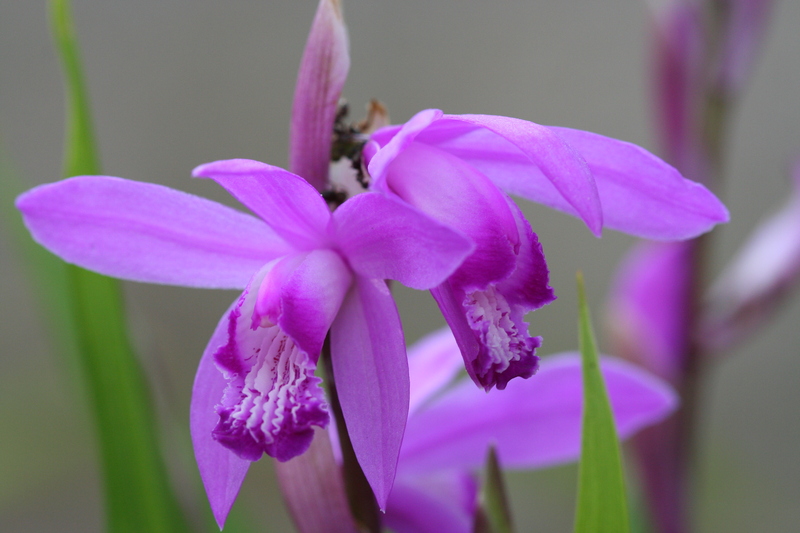 We choose the popular variety Waterlily, with double lavender-pink flowers. The bulb was in flower when we bought it and currently sits in a Chinese bowl on Chantal’s desk, a curious sight in the reception. From our “must have” list we choose a specimen of Arbutus unedo, an evergreen shrub with Lily of the Valley-shaped flowers and strawberry –like fruits. 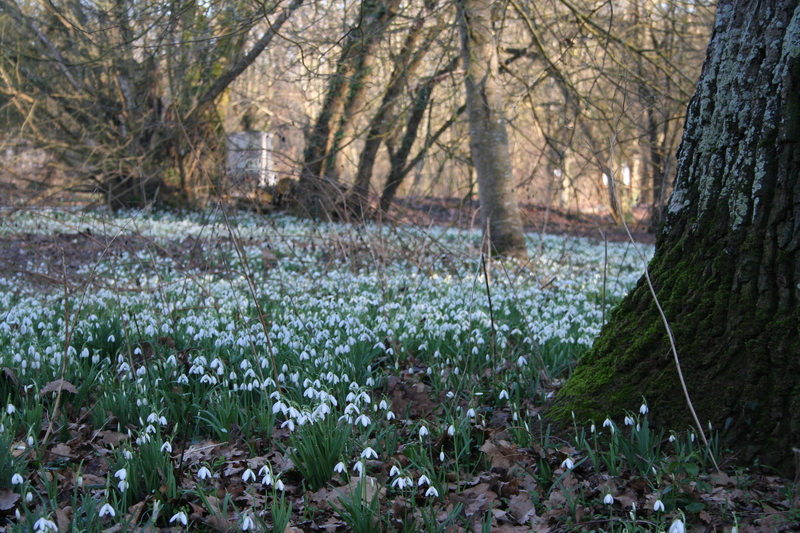 I have planted many in Hertfordshire for clients and missed seeing it in our own garden. Now that this has been rectified we need to choose a special spot to show it off. 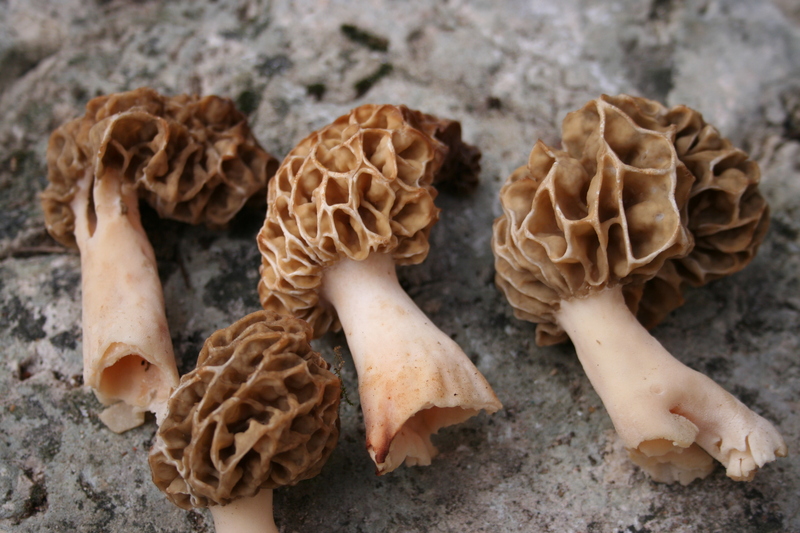 In the autumn it carries both last season’s fruit and new flowers and when larger the peeling red bark and gnarled stems are very attractive. Being a Mediterranean native a sunny position will be selected for it. From a Loire Valley grower we chose a couple of climbers: evergreen Honeysuckle Lonicera henryi Copper Beauty and Clematis viticella alba luxurians. One of my favourites, C. ‘Alba Luxurians’ is covered in flowers from mid-summer to late autumn. 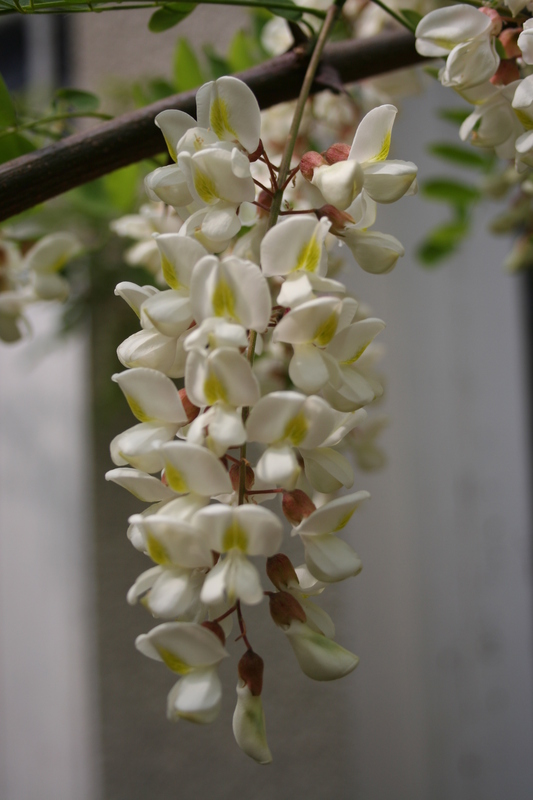 Its white blooms are tinged with mauve and have a greenish tips. It is a member of the viticella group of clematis and as such it shows good resistance to the dreaded clematis wilt. As with all the late-flowering clematis, pruning is easy. 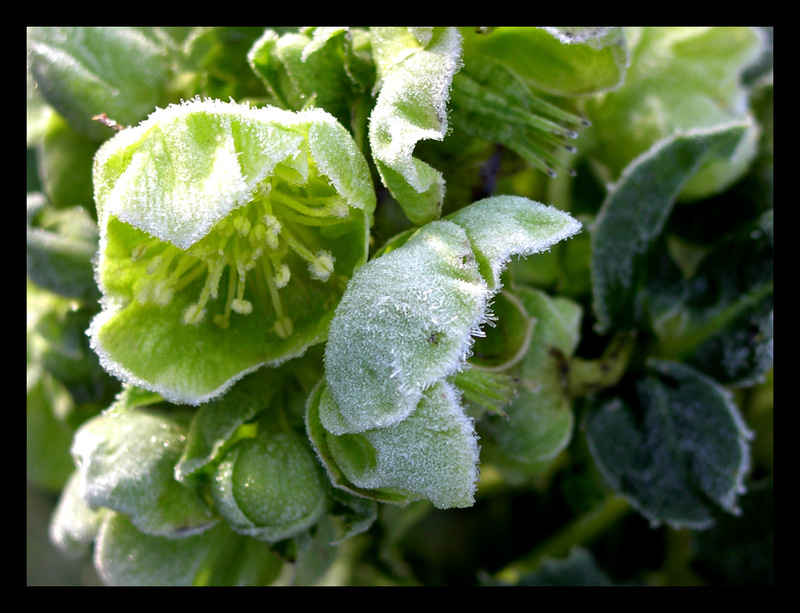 You simply cut back the stems to a pair of strong buds 15-20cm above ground level before growth begins in early spring. This pruning technique makes late-flowering clematis useful for training into shrubs, trees and climbing roses as the clematis growth is removed each spring and so never becomes too much of a burden on its supporting plant. The other is an absolutely gorgeous evergreen Honeysuckle with large, shiny deep green foliage that is bronze when young. 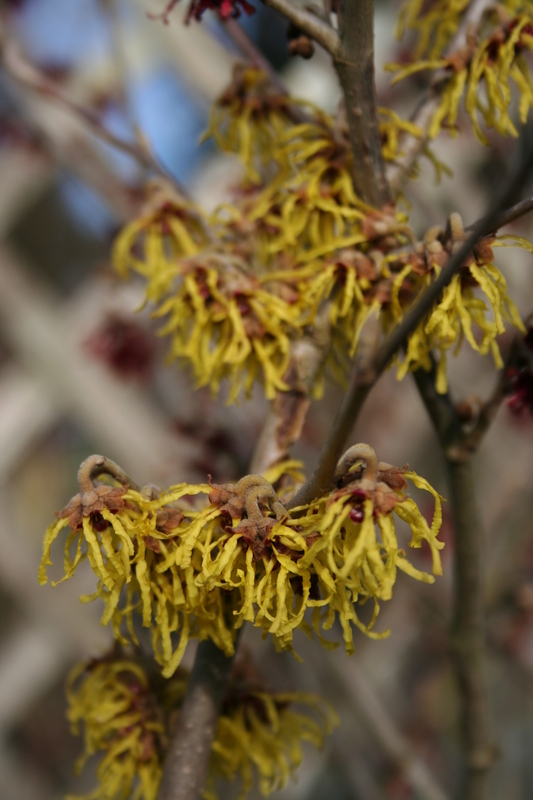 Copper Beauty produces sweetly scented copper-yellow flowers throughout summer followed by black fruits in autumn. It has been suggested it is good to plant with Clematis armandii and as we have one of these we will consider this as an option, but we also have spots for it in the front and against the walls of the log cabin. One final plant to mention from the half dozen I have yet to tell you about; on our way out of the show, when we were overwhelmed, dazed and venerable, we came across the stand of Tropique Production, who specializes in hardy but exotic looking plants like Hedychium. The Ginger Lilies are among the most exotic looking herbaceous plants you can hope to grow in a British garden. Great thick, creeping, ginger smelling rhizomes send up ‘canes’ with bold, alternate leaves in two ranks, around the beginning of April. No Hedychium is a straightforward hardy perennial right across the UK. On the other hand, none are out-and-out heated glasshouse subjects and this is a toughie. Pink V is delightfully scented hybrid from Tom Wood in Florida, with apricot coloured flower spikes and has already been planted next to our Dining Island where we can appreciate it as we eat. It will need feeding and plenty of water in the growing season and this first winter I shall protect the crown. Tired, broke, but happy, we drove home down the motorway and had no difficulty filling up with fuel at a service station close to our junction. When we arrived we discovered someone had stolen the potted tree fern from our front garden. Serves us right for having too much fun, I suppose. Dicksonia antarctica is back on the wish list. Today was Regional Election Sunday. Chatting to locals it seems that half the people do not vote in the regional’s, arguing that they do so for the European, Presidential and Parliamentary elections and of course for the local mayor. But the town square was crowded today with people discussing politics in the cafe, at the baker, the grocery shop and outside the church. Preparations for this afternoon’s important boules competition added to the sense of carnival and as we walked the dog through the town a brightly coloured bicycle race poured down the main street. In France there are three levels of local government: the commune, the department and the region. It is with the regions that the real power now lies following recent attempts at decentralisation. The region of Le Centre holds the purse strings and local mayors, for all the considerable respect they are given, have to go cap in hand to ask for cash for local projects. Having left France for England before her 21st birthday, Chantal has never voted in France so we were ignorant and quite excited about the process. We have been asking everyone we know to tell us how it works and this had led to some delightfully animated conversations over the past week or two. In the end she took her voting card (in her maiden name) down to the Salle de Fête, fighting through the Sunday morning crowds to the voting hall. Each main candidate is represented by a sheet of paper indicating his name and those on his party list. Voters pick a selection of these sheets together with an envelope. They then disappeared into a booth where, hidden from view, they place the leaflet of their preferred candidate’s team in the envelope and present it to the officials sat at the table with the voting box. Next Sunday they will do so all over again for the two or three candidates remaining in the race. As a foreigner, I stayed outside with the dog, shaking hands with all the people we knew and complaining that the poodle and I were excluded from the vote. After all that excitement we headed off to the woods, me to hunt for flora and the poodle to chase the fauna. We found several wild Daphne shrubs amongst the trees, while the dog amused herself with a hare, a deer and several pheasants. 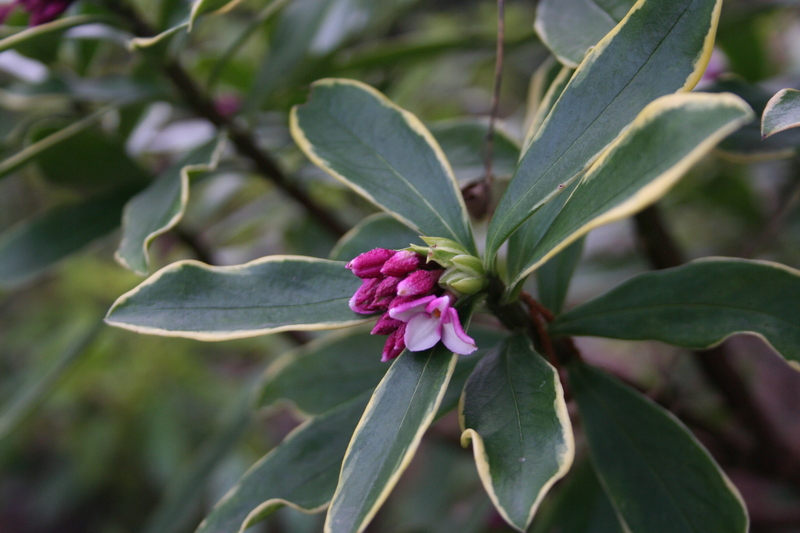 Daphne laureola is an undemanding evergreen shrub, ideal for dry soil in shade and an excellent backdrop for Hellebores and Snowdrops, which flower at around the same time. The slightly fragrant lime-green flowers are a god-send for early bees, much less showy than many Daphnes, but very welcome all the same. It grows wild on the greensand ridge near Ampthill in Bedfordshie and, we have discovered, on limey-clay in the centre of France. 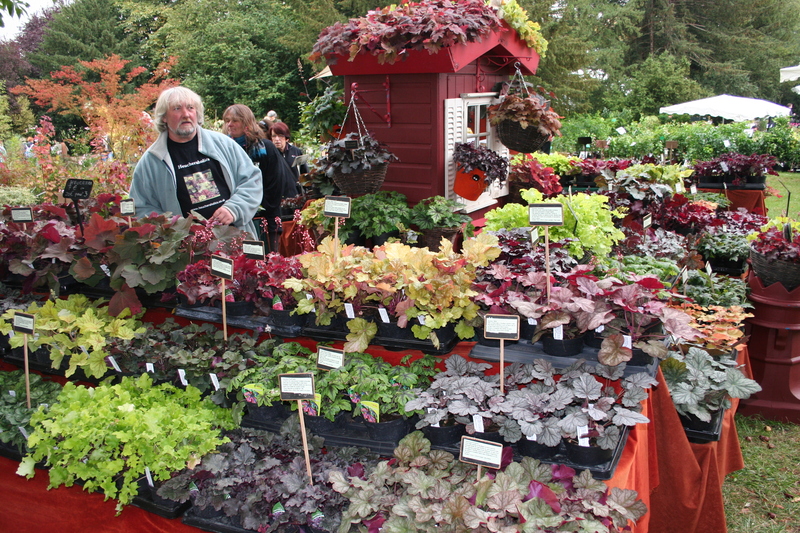 The list of plants coping with these conditions is not large, so a plant like this is very welcome. Plants tolerating the same conditions inevitably flower in the spring, before the trees take all the light and while there is still some moisture in the soil. 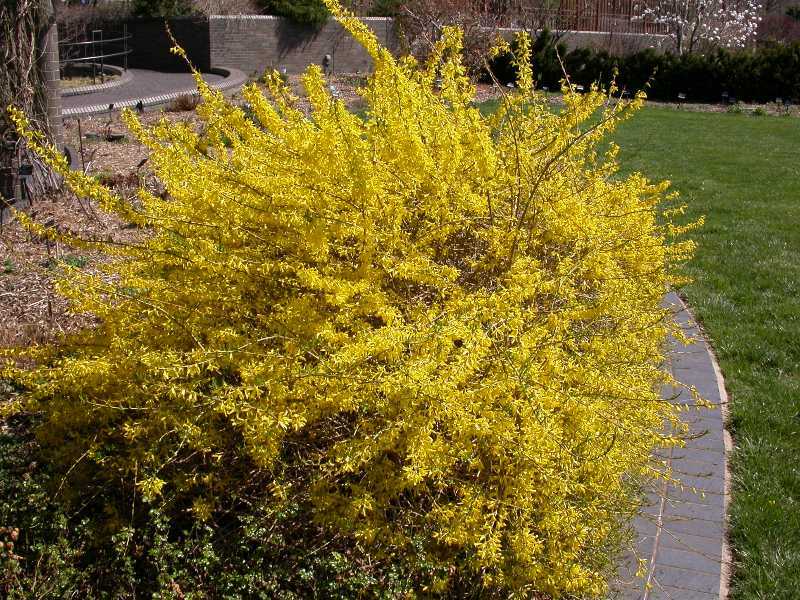 I often plant Forsythias under conifers, especially the French variety Marée d’Or (Gold Tide), which grows only 60cm tall but 2m wide. This and many other fine Forsythia varieties were produced in Angers in the Loire Valley, the results of a breeding program involving exposing the plants to radiation. I gather this was deliberate, rather than an accidental leak from the local nuclear power station! Another standby for such challenging conditions is the Flowering Quince, or Chaenomeles. 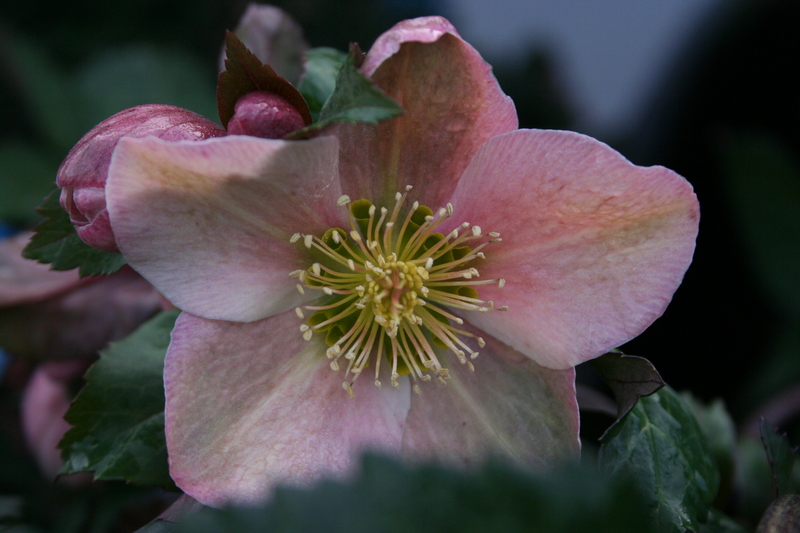 C. japonica and speciosa are Japanese and Chinese plants respectively, while Chaenomeles x superba is a hybrid between the two. These spiny plants come in a range of colours – shades of white, pink and red – and in heights from groundcover to 3m or more. They can be trained up a shady wall, shaped into a security hedge or allowed to ramble at the base of trees The Chinese use the fruits medicinally to assist blood circulation and relax muscles, having dried and sliced them after harvesting; we use them in jam. Back in the woods again and we come across a deer that had been hiding in the undergrowth. The dog goes haring off in hot pursuit while I find myself in the middle of a huge clump of Solomon’s Seal. I have always considered this to be a rather choice plant, to be grown in the shade with other spring flowering herbaceous gems like Dicentra and Corydalis. 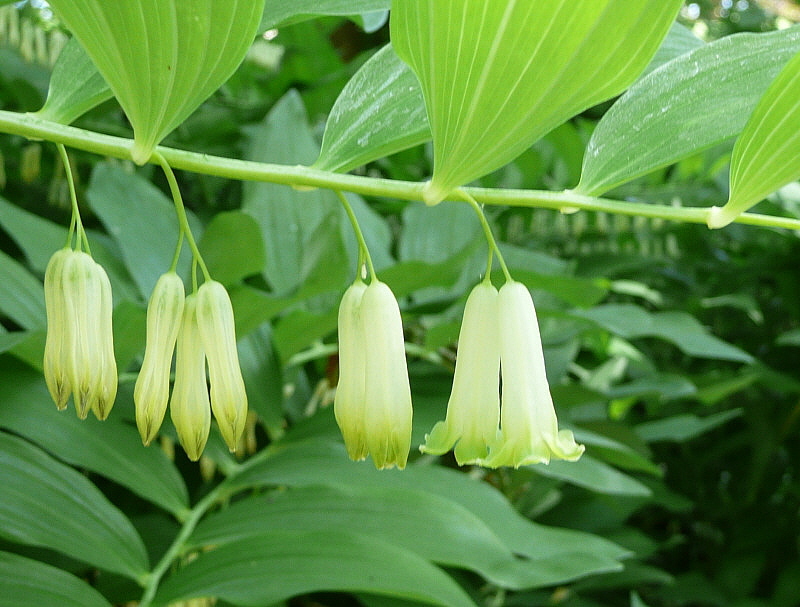 There are a number of different species of Polygonatum and I make a note to return to this spot, take photographs and try to identify the plant. 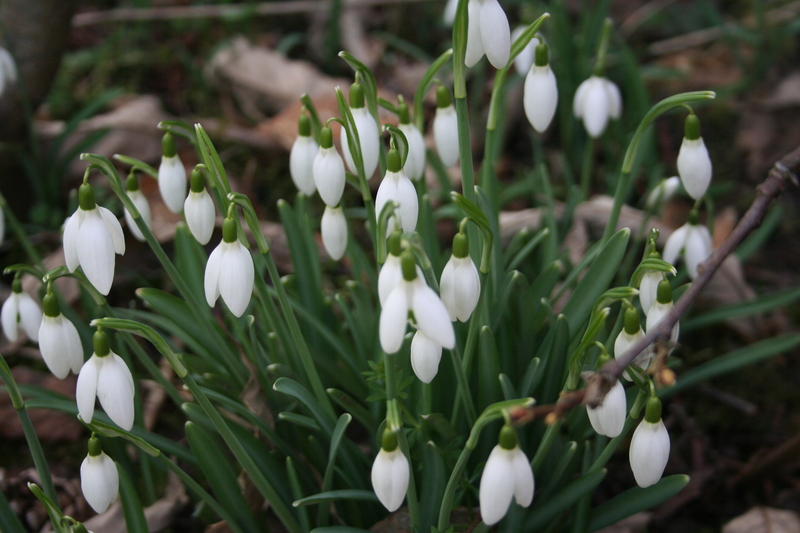 Nearby there are patches of Lilly of the Valley, Muguet in French, the flowers of which are sold by gypsy children in the market square for the 1st May. 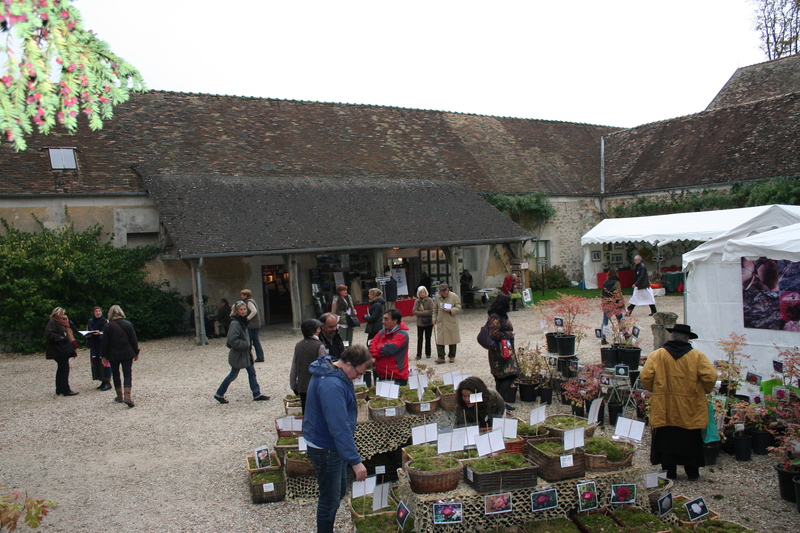 Gardens in France tend to have trees so knowledge of shade loving plants is important. Our own garden suffers in places from the shade and dryness created by neighbours’ conifers and we have walls along two boundaries. One of them, we discovered, has been built in such a way as to steal a metre of garden from us along its entire length, requiring expensive correction at some stage. The French are not above taking the occasional liberty when backs are turned. While the walls create a little shade, the biggest shade challenge is also a delight: our two massive, one hundred and fifty year old Sequoias. Sequoias are touchy-feely plants: they have soft, spongy, red-brown bark which would turn the most serious of you into a tree-hugger in the time it takes to open a bottle of Touraine. Guests at our B&B have complained about the brambles at the base which discouraged close inspection of the trees, so I have had to get out with the strimmer and clean them up. Later, when time and money allows, I plan to build a deck which will be cut to the shape of the trunk so that we will be able to sit with our backs against it and look up into the heavens through its branches. The trees are a magnet for wildlife; I have installed a lovely Japanese granite water bowl for the birds, insects and dog to drink from and gradually I am planting closer and closer to the base. Our students’ geographical diversity has added an extra dimension to our gardening. 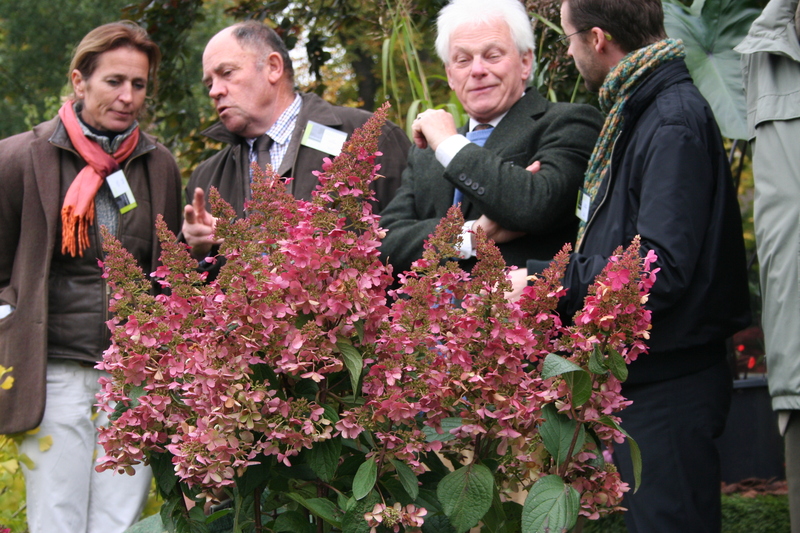 We now have a large group studying the RHS Certificate in Horticulture and a few on the Certificate in Garden Design, all responding to our teaching with experiences of their own. Talking about shade loving plants brings comments about gardening in Canada, the USA, Australia, France and all over the UK which enhances our knowledge and excitement for the subject. With gardening, you never stop learning.